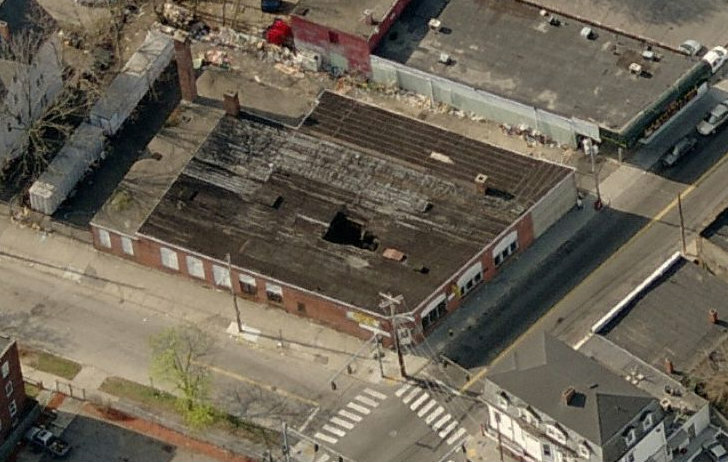 Aerial view of 618 Cranston Street from Bing Maps. WPRI reports that a vacant building at 618 Cranston Street caught fire yesterday afternoon. The owners of this same building are seeking approval from Zoning to tear down the building, described as a “ruin,” and construct a drive-thru restaurant on the site. ZIAD KHALIL AND MYRA KHALIL: 618-630 Cranston Street, also known as 117 Linwood Avenue, further known as Lot 908 on the Tax Assessor’s Plat 43, and located in a Limited Commercial C-1 Zone; to be relieved from Sections 303-Use Codes 57.1 & 57.2, 305.1 (Footnote 10) and 607.3 in the proposed demolition of the ruins of an existing building and to construct a new 60’ x 44’ single-story building that would contain a restaurant with drive-in window. The applicant seeks a use variance requesting relief from regulations restricting the size of restaurants to 2,500 square feet of gross floor area in a C-1 district (the proposed construction would be 2,640 square feet, not including basement storage), and relief for the proposed drive-in window, which is not permitted in a C-1 district. The applicant further seeks a dimensional variance from Section 305.1 (Footnote 10) in that the building lines at street level will not be coincident with the lot lines as required; and for a freestanding sign with an area of 75 square feet (20 square feet allowed) and a total sign area of 175 square feet (90 square feet allowed). The lot in question contains approximately 16,729 square feet of land area. This application was also on the last month’s zoning agenda. It is unclear from reading published reports exactly when this fire started, but WPRI also reports that a fire at 84 Daboll Street was caused by a lightning strike during yesterday afternoon’s severe thunderstorm outbreak. Seems a little too convenient. Demolition by Neglect and lighting seem to strike the same places, though Demo by Neglect is a lot less rare. Funny how these things always happen. Especially when the owners are proposing a questionable usage. Sen. Juan M. Pichardo is calling on the owners of vacant properties to secure their properties in order to keep the neighborhoods safe, or to foot the bill in the event that their negligence leads to calamity. Any updates on this one? The building has since been torn down and it both this lot and the one diagonally across Cranston are now surrounded by temporary construction site type fencing. Lots of construction on Cranston St this summer.